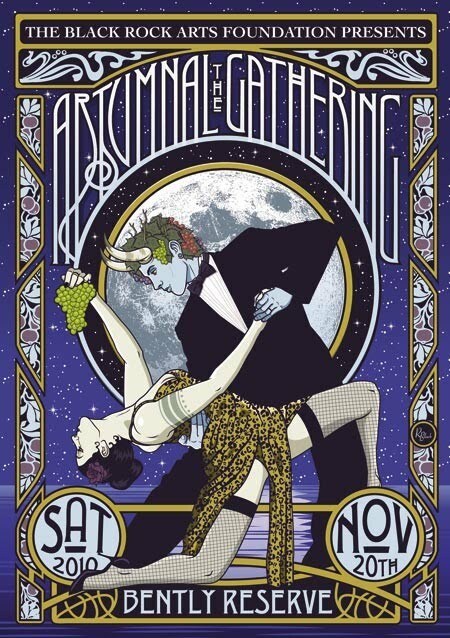 The Artumnal Gathering is Coming! The Black Rock Arts Foundation’s annual celebration of the vital spirit and extraordinary artists that enrich us all. You are invited to the magnificent Bently Reserve for BRAF’s fourth annual Artumnal Gathering, an exquisite evening of tempting libations, bountiful fare, engaging art, and lavish attire. You’ll enjoy three elegant rooms, each overflowing with art and offering a stunning array of featured live performances including soaring aerial artistry, and music and DJ’s to dance the night away. Come revel in the abundance of our community’s creative spirit, celebrate Black Rock Arts Foundation’s artists and projects, and support the proliferation of even more community art projects around the world in 2011! A limited number of $35 online first tier tickets go on sale September 24th. Second tier tickets are $45 dollars. Join us for our pre-event dinner featuring delightful fare, cocktails, and both live and silent auctions. Last year’s event sold out! Get your tickets today! Includes an evening of featured and roaming performances, DJs, dancing, raffle, silent auction, photography sale and surprises. Includes an individual seat for a sumptuous dinner, auction, performances, signature drinks, wine, dessert and entry to the Artumnal Celebration. Includes a reserved table for eight guests for the Feast of Imagination dinner. Includes a reserved table for eight guests for the Feast of Imagination, with premium seating placement in the banquet hall, premium wine selection with personal sommelier, champagne toast and treats.